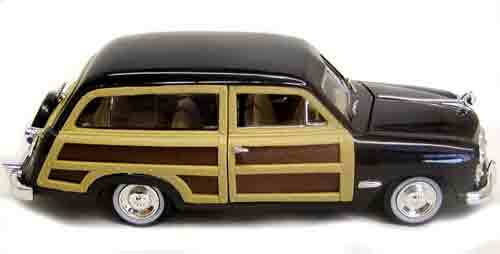 This 1949 Ford Woody Wagon 1:24th Scale is by Motor Max and of the Die Cast Collection Series. The hood opens to reveal a beautifully detailed chrome engine and the hood itself has a chrome ornament. The interior has three bench seats, detailed dash board and tan in color. This classic oldie has stock chrome wheels and white wall tires. It has working front suspension, when the wheel move it turns the steering wheel. This model is free wheeling and the doors open.